Pride of Baltimore Inc. is proud to announce a new public-private partnership with the state of Maryland to promote economic development for the state and city of Baltimore. New state funding will allow Pride of Baltimore II to expand its economic development activity in the state, around the country and in other nations. The state has committed major funding to Pride of Baltimore Inc. for the next three years. The organization will use the funds to underwrite the Pride’s activities and expand its focus on selling Maryland and Baltimore as strong economic markets. 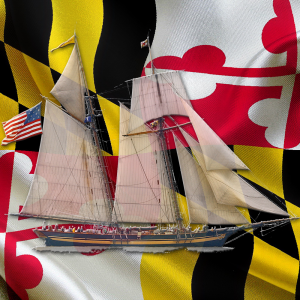 As one of the most respected tall ships in the nation, Pride of Baltimore II generates intense excitement at every port and provides a vivid reminder of the state’s rich commercial history and vibrant economic opportunities. Click here to support Maryland’s Pride.